Mom taught me how to sew when I was in second grade. One of my first projects was a t-shirt. Another project was a big stuffed whale. Mom had to help me with the zipper…the mouth had zipper lips to open and close it. I was delighted when she made the mistake of sewing the zipper in backwards (the zipper pull was towards the inside of the mouth). My part of the sewing was perfect…the biggest error was Mom’s. What Mom didn’t teach me was how to finish a project in a timely manner. She has very little interest in finishing one project before starting another. This has been very freeing to me. Perhaps a little too freeing. I have no idea how many started, but unfinished projects I even have. In the fall of 2011, a book caught my eye. It is Scandinavian Needlecraft and includes great embroidery designs, mostly on wool. The book wasn’t in our library system at the time, so I tried Scandinavian Stitches instead. Author Kajsa Wikman has lots of great designs in it, including soft baskets and stuffed fabric birds. 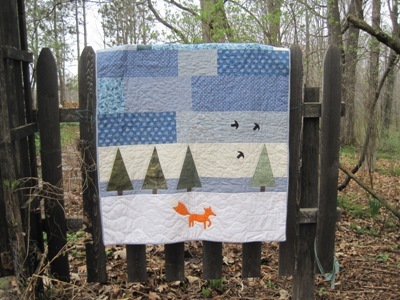 I loved one of the baby quilts in the book, but I wasn’t about to make a quilt just to hang on the wall. It occurred to me that Jessie was having a baby in December and the quilt has lots of blue in it (a color that she might not see enough of these days). A winter theme, lots of blue, and a December baby…a perfect combination. I dug through my stash and found the perfect colors for the sky. I needed a little more variety and was happy to find a great match at the local thrift store. A couple of small pieces were added for variety and everything was ready to go. The cutting and sewing began at Mom’s house on Thanksgiving weekend. The top went together quite quickly. 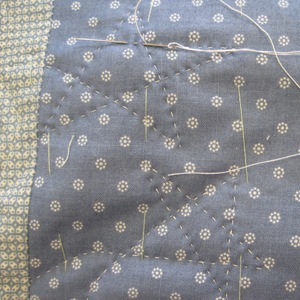 The hand quilting took longer. It turned out to be the perfect project for me. I quilted at the hospital while Grandpa Neil was there. I quilted at Grandma Siggie’s while we spent time together. I quilted at the nursing home while Grandpa Neil was there. I quilted with friends while taking time for myself. Some of the stars are less than perfect. Some stars have more than five points. Maybe Ivy and Clara will look for them when they need a quiet project. Since I’ve never finished a quilting project, this was my first attempt at cutting the binding on a bias. I thought about it for quite a while, folded the fabric, and cut. Was I ever surprised to find the zig-zag that it made. Hindsight was much clearer than foresight. 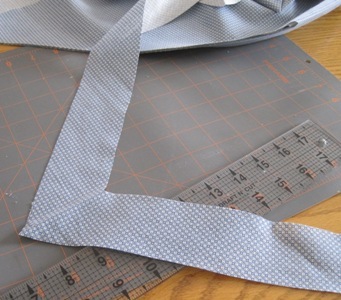 It was a happy day when I got the bias tape cut, ironed, and rolled. The binding finally was domesticated. It was time for the label. Jenny made one for the quilt, but it wasn’t quite what I had in mind. A friend told me about her label making process: spray adhesive on a sheet of printer paper; apply an oversize piece of fabric on it; cut the fabric to the size of the paper; feed the paper/fabric into the inkjet printer; print with the desired text; and set with a hot iron. Since I hope this quilt will withstand lots of washing, I decided to make the label more permanent by embroidering on top of the ink. It then seemed to take forever to finish the label and sew it onto the quilt. 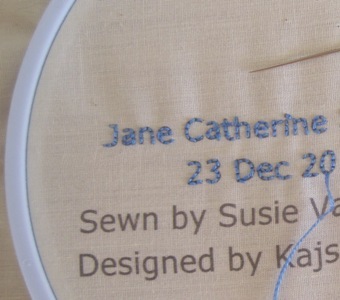 I had put off putting the binding on so that I could sew the label only on to the back of the quilt. I did everything just right for this process until the last moment, a moment of excitement, when I sewed the label through the entire thickness of the quilt. 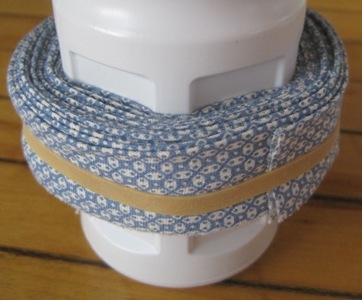 It was fortunate that the bobbin thread was white and nothing puckered in the process! I wasn’t about to tear it out at this point. The finished quilt was ready to give to Jane on March 24, when we celebrated Grandma Elma’s 93rd birthday. Jane and I met for the first time. It was a good day for many reasons, a small one was that this project was completed! 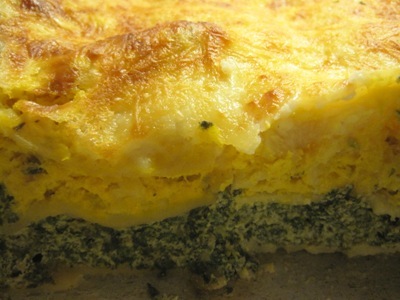 George made a very good supper of squash and nettle lasagna tonight. That’s right…stinging nettles turned into a yummy supper. This entry was posted in Uncategorized and tagged books, grandma, grandpa, Jessie, projects, quilts, sewing. Congratulations. I find that it is easier to start a quilt than to finish one, but oh the satisfaction of finishing the binding! Nice work. Susie, the quilt turned out so great, I love it… and I’m sure once Jane does more than drool on stuff she’ll love it too! Thanks for making such a special gift for Jane! Now I have to go count star points before bed. Does that work as good as sheep do you think? The quilt, the story of its construction, and the lovely photo of the completed quilt are all perfect! Congratulations on the quilt Susie, I loved reading your story. Now I must go eat something, not as delicious as George’s supper I’m afraid. I am going to search out that recipe! Beautiful! Aren’t you proud of yourself? You should be! This link contains at this moment seven (7) posts. More are coming next moth.